Trying to start a reboot of the posts here on Brain Windows. Lots of great stuff has come out since the last regular posting period, and unfortunately I don’t have the time to cover it all. 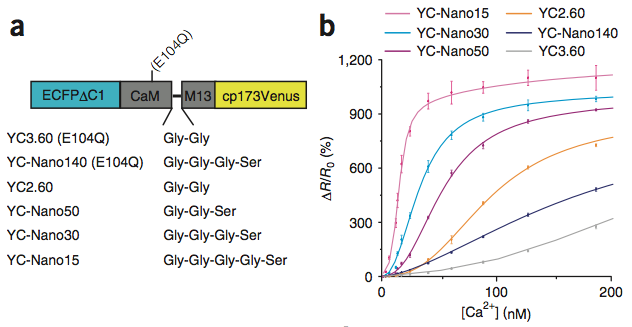 One of the most exciting papers of the last few months was Rapid blue-light–mediated induction of protein interactions in living cells published in Nature Methods. This paper reports the logical extension of previous technologies for photoactivatable transcription we previously covered here, here, and here. There are two key technical improvements in the system from the Tucker Lab. 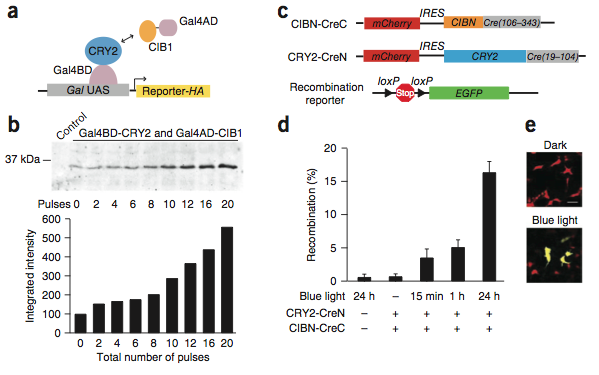 First, the genetic light switch, a cryptochrome 2 (CRY2) interaction with cryptochrome-interacting basic-helix-loop-helix protien (CIB1), is activated by blue light rather than the red light of previous switches based on phycocyanobilins. Second, and more importantly, the cofactors necessary for the switch action (flavin and pterin chromophores), are endogenously expressed in mammalian tissues. Thus, these switches should be usable in vivo without potentially tricky loading of the cofactors. Upon illumination, the authors observed rapid translocation (in 1 second!) 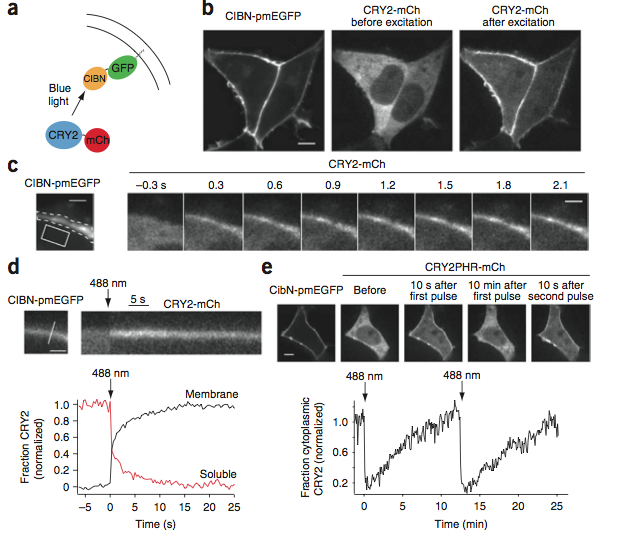 of fluorescent proteins tagged with CRY2 to cell membranes with CIB1 anchored to it. They also were able to couple it to Gal4-UAS and Split-Cre expression systems, which let them drive reporter genes such as GFP by blue-light illumination. I was a bit underwhelmed by the efficacy of the cre-induction, only around 15% of cells expressed the cre-driven EGFP after 24 hours of illumination, but maybe that is due to my ignorance of the current limits of the split-cre system. That efficacy will certainly need to be improved for the REALLY cool stuff one can imagine doing with this. What are the cool things? Well, say you are doing some GCAMP3 imaging of a few hundred cells in the cortex during an awake behavior. You see an ensemble of neurons whose activity is correlated to some aspect of the behavior, like a motor command, a perception or a decision. You want to prove the function of these neurons, to investigate their coding by subtracting or adding activity directly into this specific functional group. How do we control ONLY this group? 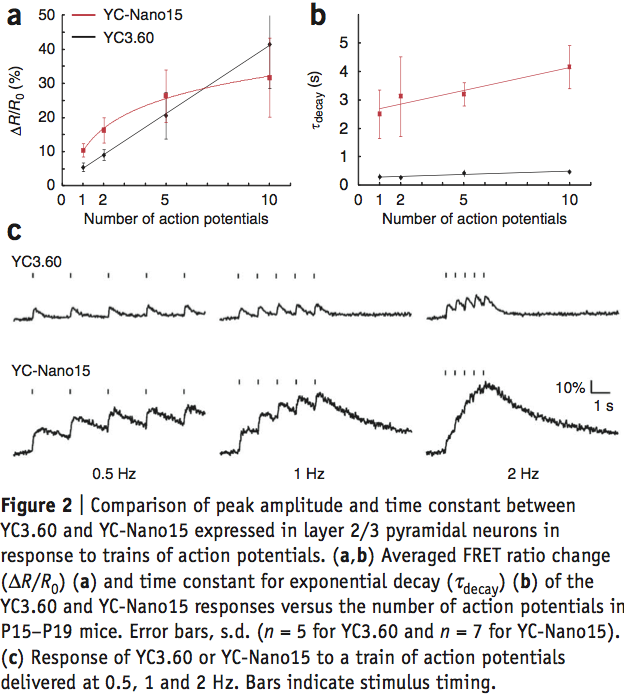 A pan-neuronal channelrhodopsin, or even one packaged in a cre-dependent virus injected into a cre reporter line will not allow you to change the spike patterns of only this ensemble. This ensemble is not differentiable from its neighbors by genetic type, only by functional relevance. You have to hit its neighbors or shared genetic subtype with the same hammer. But if you have one of these CRY2-CIB1 split cre switches that drive ChR2 expressed across the cortex, you could shine a blue laser (or presumably a two-photon laser) onto the members of the ensemble and turn on optical control of only that functional group. Details of course still need to be worked out. What is the 2p cross-section of the system? How do you make it compatible with optical imaging and optical control? How do you improve the speed and efficacy of the switch? These are things that will come with time. The power of this technique is even recognized by apparent competitors in the field; Anselm Levskaya closed his packed SfN talk on phycocyanobilin-based optical switches with a shout out to this work.